I’m in the middle of two Colette Hawthorns this week. I met up with both daughters and was able to mark the hem for one and discuss possible alterations on the sleeves for the other. Both live in different cities, so it takes awhile to finish the dresses because I need to try things on them. We actually met up in a hotel room in Redwood City for a quick visit, and business at Stanford Medical Center. My daughter’s friend captured this candid shot of mother and daughter. Look at the smile on her face! I’m so thrilled that she is pleased. 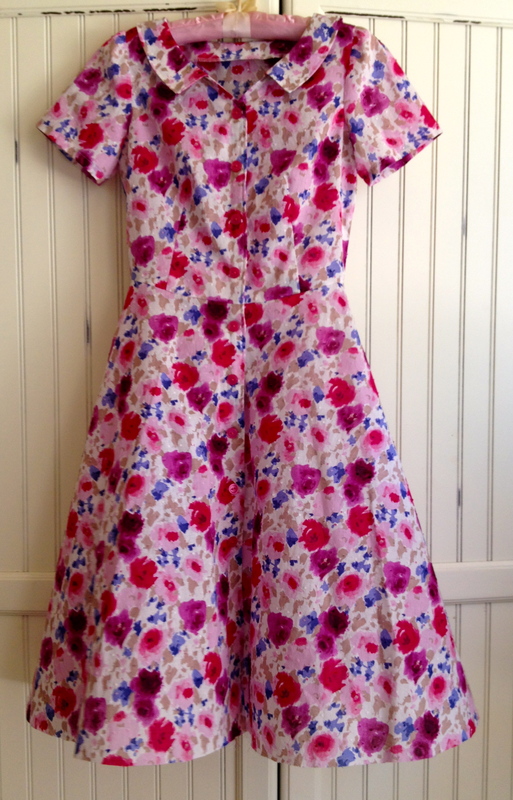 This dress is a size 4 with an FBA, and a redesigned front. The girl likes a little skin showing above the bosom. She also requested tiny sleeves. So following a sewing tutorial, I cut tulip sleeves and finished them with bias tape turned to the outside for trim. The other Hawthorn has an SBA. So this bodice is almost the opposite. I kind of winged it with the SBA. I didn’t really understand the directions on Colette’s tutorial. So, starting with a size 2 muslin on her body, I pinched out a section of fabric from the dart all the way up to the shoulder. At first, I thought I would try a princess seam, but then I just started manipulating the paper pattern until it accounted for the pinched out section. It was not very scientific, but it worked. Now I have a decent flat pattern that will fit her perfectly. This one still needs to be hemmed. I love the soft light cotton and the beautiful watercolor flower pattern. I have one more to make, so stay tuned! Thanks for looking. 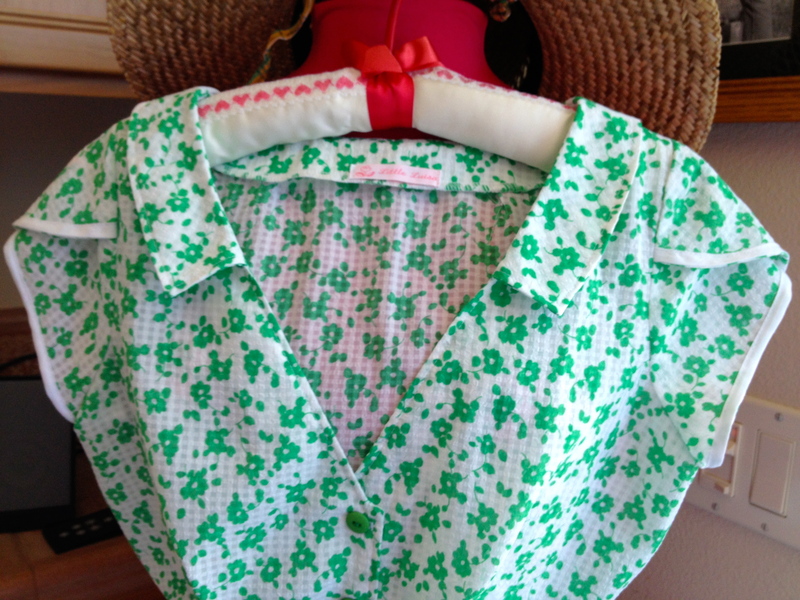 This entry was posted in DIY, Family, Sewing and tagged colette hawthorn, diy, FBA, SBA, sewing, Tulip sleeves. Bookmark the permalink. Can’t wait to try it on!! They are both beyond adorable! Nice work on creating two totally different looks. 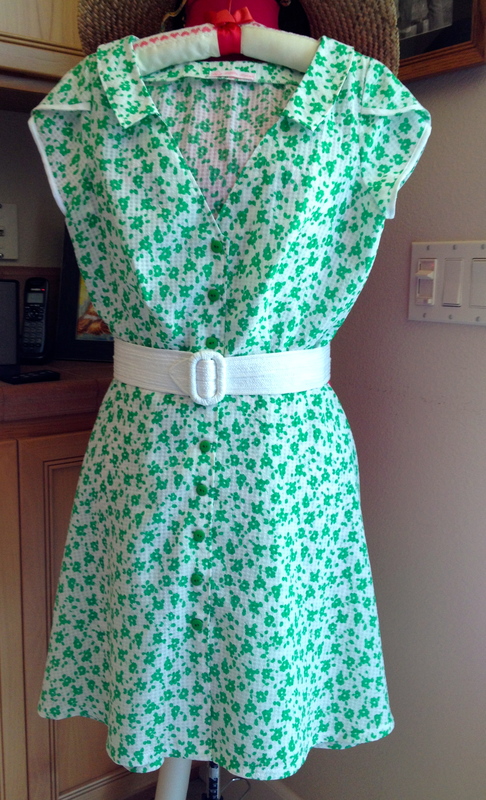 I love the sleeves on the greeny and love the fabric of the other! I like the tulip sleeves too. That’s the first time I’ve ever drafted them using a how-to from the internet. It’s pretty easy. I’m looking forward to seeing how yours turns out.